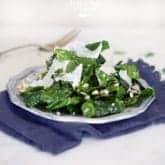 The beauty of this black kale salad is you can prep and dress it at the beginning of the week and just grab handfuls of it when needed. PLUS it actually tastes good. Prep kale by removing ribs and cutting leaves into 1/4" - 1/2" strips. Whisk together the first 6 ingredients. Pour dressing over prepped kale. Massage dressed salad then refrigerate overnight. Add big shavings of parmesan cheese and a handful of croutons or crumbs and serve. Salad will keep, dressed, in the fridge for up to a week.